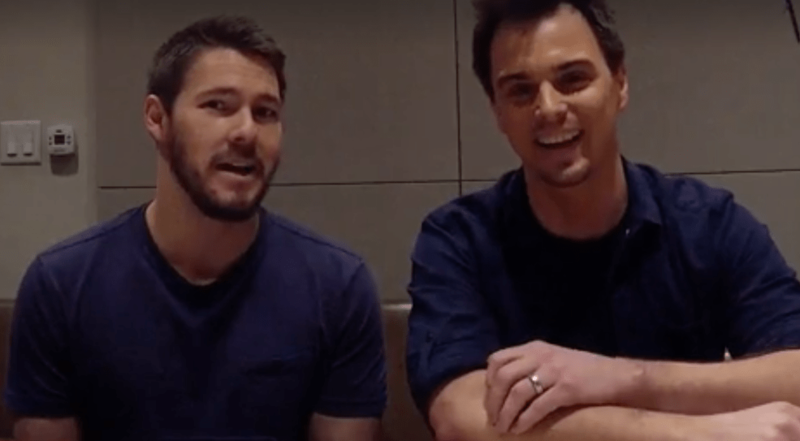 Scott Clifton (Liam Spencer) and Darin Brooks (Wyatt Fuller) answered fan questions about their roles in “Bold and the Beautiful” (B&B) in a video posted online last week. It’s More Than Just Steffy! Though many fans wanted to know about both Liam and Wyatt’s relationship with Steffy (Jacqueline MacIinnes Wood), Clifton and Brooks said their sparring is based on more than wanting to be with her. Scroll down for the full video, which B&B posted on its official Facebook page. “We both want our father’s love,” Clifton said. Brooks agreed that a desire for Bill’s (Don Diamont’s) approval underlies much of their brotherly competitiveness. Clifton and Brooks also pointed out that there is as much love and friendship between their two characters as their is opposition. One fan asked what it would take for Liam and Wyatt to stop being “brenemies.” The actors agreed that putting some physical distance between them might help. They also concurred that ceasing to go after the same women and validation from Bill would improve their relationship. “The truth is, do you really want Wyatt and Liam to put down their swords?” Clifton wisely asked. Well, maybe not. After all, conflict is the basis for drama. Clifton noted that he and Brooks, as the love/hate brother duo on B&B, often get to provide a much-needed lighthearted element to balance the heavy drama most often featured on the CBS sudser. “We are fortunate enough to get to the be the ones to do that,” Clifton said of his and Brooks’ frequent fun interaction on the show.